Entry to all participating gardens except for those with balloted entry. Please see www.opensquares.org for further information. 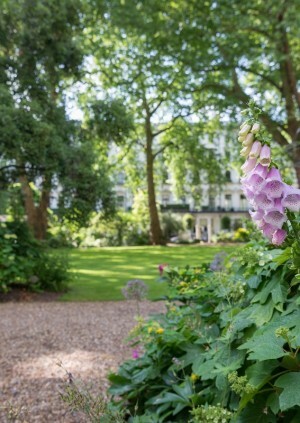 This special discounted price offers exclusive access to London's private, secret and little-known gardens in central London during the weekend of 8 and 9 June 2019. It is time limited and will not be repeated. Please note that entry to some gardens taking part is by ballot only. Whilst we hope to open all of the gardens listed in the guidebook, some may not be able to open at the last minute due to unforeseen circumstances. Tickets are non-refundable. Option to create a gift ticket. Feed your curiosity and explore London's private, secret and little-known gardens across the city over one very special weekend. Tickets for Open Garden Squares Weekend 2019 will be on sale from 10am Tuesday 12 February. Adult tickets (£15) Student (£12) and Young Person 12-18 yrs old (£8) tickets will be available. Children, 11 years and under, are free. These discounted prices are available until 8 May at 1159hrs. The tickets will then be sold at full price from 1200hrs on 8 May: Adult £20, Student £16, Young Person £10. Carers are entitled to a free ticket if accompanying a ticket holder. Please contact info@eventcube.io to obtain these tickets. Gardens range from the historic and traditional to the new and experimental, and include private gardens, roof gardens, community allotments, gardens belonging to historic buildings, institutions, cafes, schools and shops. A portion of each ticket price is returned to the community and volunteer run gardens. One ticket grants access to gardens (apart from those with balloted entry) on both Saturday 8 and Sunday 9 June 2019. Gardens opening times and days may vary. Children up to 11 years go free. For more information see www.opensquares.org for details. With your purchase, you will be emailed an e-ticket for you to print out and use over the Weekend. You may also show the ticket on your phone. You will receive one guidebook per pair of tickets by post in May and June 2019. Unfortunately we cannot post guidebooks overseas, but they will be available for collection on the weekend (or posted to your nominated address, such as a hotel). Please note that gardens are subject to last minute cancellations and withdrawals. Whilst we do our best to minimise this, it is beyond our control and we advise not buying a ticket purely to see one particular garden.